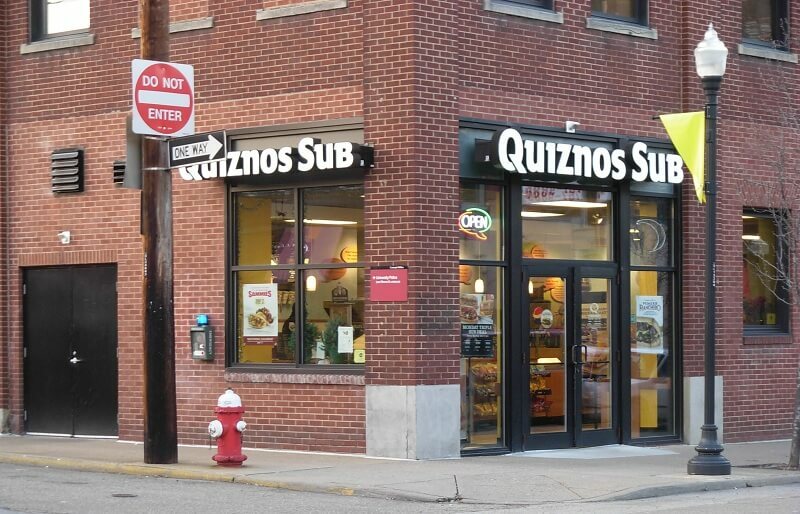 Quiznos was founded in 1981 and steadily grew to over 5,000 franchised locations in 1991. Many locations closed down between 2007 and 2009, a tough period for any business in the U.S. Today, the company owns approximately 1,000 fast-food restaurants in the U.S. and another 600 in over 40 countries from Europe, the Middle East, Western and Southeastern Asia, or Central and Southern America. Other 1,000 locations are expected to open up in Indonesia, Pakistan, Singapore, South Korea, or the Philippines by 2020. Deli classics: An assortment of toasted sandwiches made out of fresh Deli ingredients. Steak Sandwiches: A steak that’s conveniently placed in a bun with everything else you might want inside. Chicken Sandwiches: Sandwiches which encompass chicken pieces and local or exotic ingredients and spices. 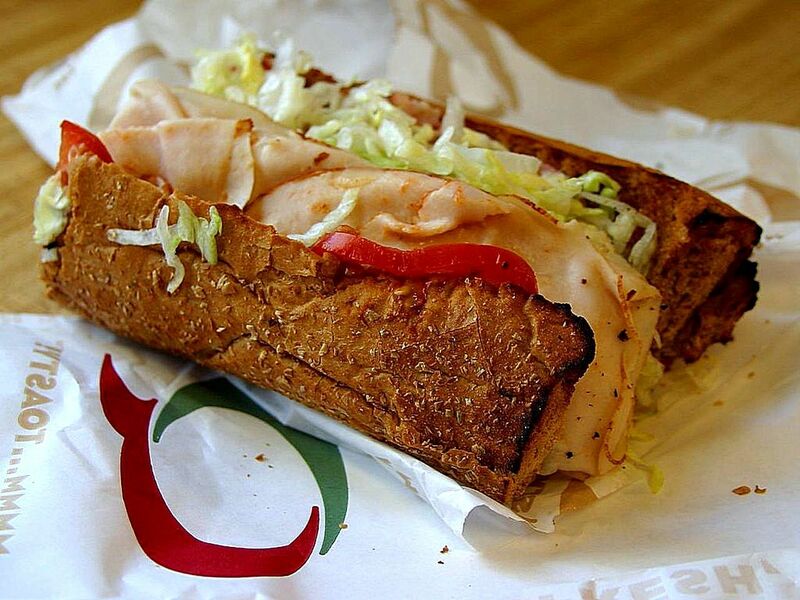 Turkey Sandwiches: Enjoy that Thanksgiving flavor all year around with Quiznos’ turkey sandwiches. Salads: Fresh vegetables, dried fruits, and hot pieces of chicken served on a lettuce blend for a healthier meal. Soups: These vary from location to location. Snacks: Quiznos can deliver potato chips together with your lunch or dinner. Desserts: You can choose between a variety of cookies and brownies. Drinks: Water, sweet, carbonated drinks, or diet-friendly lemonades. What sauces does Quiznos use? Quiznos uses a variety of unique recipes to create flavorful sauces and dressings. The main ingredients are peppers, vinegar, balsamic vinegar, sour cream, limes, olive and herb oils, mustard, honey, cheese, red wine, garlic, pepper, salt, tomatoes, cucumbers, or other herbs and spices. What bread does Quiznos use? These are subject to change, so always check this info with your local restaurant if you have preferences regarding bread. Although each sandwich requires a certain type of bread, we are sure Quiznos employees will be willing to fulfill any special requirements you might have regarding this. What sandwich size should I choose? 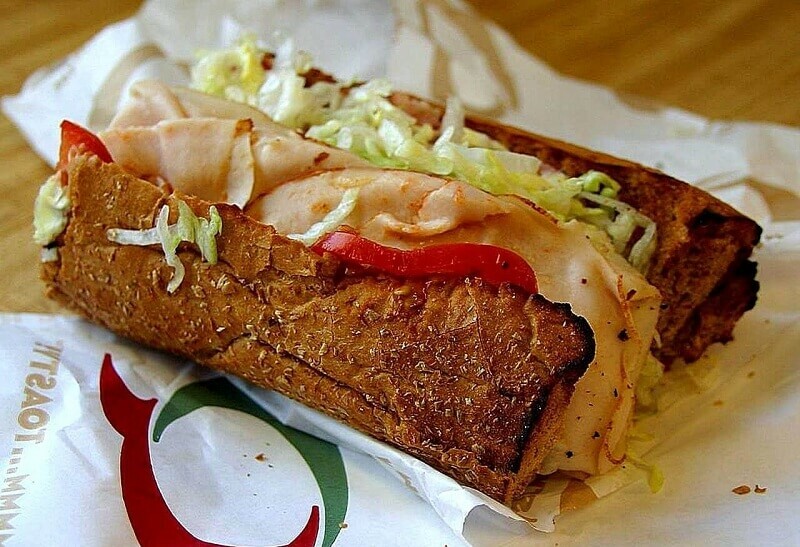 Large sub: 11 inches long. At the moment of writing, Quiznos food was not gluten-free. Why are there no prices on the official Quiznos website? As stated before, most Quiznos restaurants are franchises – which means they can set their own prices. Variations exist not necessarily because owners want to increase their profits, but mainly because ingredients are priced differently throughout the U.S. and the rest of the world. An international pricing policy would mean some restaurants will not be able to make any profit or worse, while others will have prices that are too high for their client base. How many calories are in a Quiznos meal? You can find out nutritional details about every item in the Quiznos menu by downloading the Nutritional Info menu. The Quiznos Delivery Menu also has a feature that shows you which items in their menu have less than 500 calories, a useful tool for those who follow a weight loss diet. Given the considerable number of Quiznos restaurants in the U.S., you can order breakfast, lunch, or dinner with Quiznos Delivery in most medium-sized or large American cities. Most Quiznos restaurants are open every day of the week, from 10:00 AM until 9:00 PM. However, restaurants in busy areas can start preparing, serving, and delivering food as early as 07:00 AM and work late into the night, until 10:00 or 11:00 PM. There are no nation-wide business hours for Quiznos restaurants because, as we said before, many of them are franchises – so each owner has the right to set its own hours. Same applies to delivery fees: Some restaurants offer free delivery for large orders, while others require a certain payment no matter the total amount of an order. You can ask for a Quiznos Delivery by visiting deliverybyquiznos.com – their official delivery website which is connected to every associated restaurant worldwide. After entering your location and finding the closest Quiznos, you can choose “Delivery” and fill in your complete address. Then, simply choose the items you want to be delivered and send the order. You can invite friends or family members to join in on your order, to make things easier and avoid miscommunication. You can pay for your Quiznos delivery with a debit or credit card when placing the order, or you can choose to pay cash when the order arrives. Customers can also use Quiznos gift cards or coupons when paying online, by typing in their unique identification codes. Hey Buddy!, I found this information for you: "Quiznos Delivery 101: Areas, Hours, Fees". Here is the website link: https://all2door.com/quiznos-delivery/. Thank you.